Chica the Pit Bull | For Animals Inc.
Are you an active person looking for the perfect dog companion to complement your lifestyle? Someone to jog with you in the morning, play a game of fetch in the afternoon, snuggle up on the couch after dinner and give goodnight kisses at bedtime? Chica is your girl! This 3-year-old pitbull mix is full of life and personality. 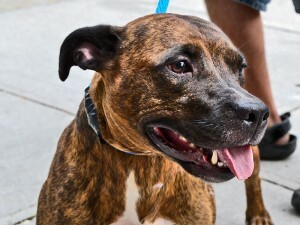 Chica seeks an experienced home as an only dog where she will shower you with love! Always eager to please, Chica is obeys commands on and off the leash, is housebroken and crate trained. Despite this she must be in an experienced home without other pets or young children. Pulled from “death row” at NYC Animal Care and Control in 2011, Chica has been patiently waiting for the perfect home ever since. Make her your one and only and you will be the recipient of a loyal companion who gives goodnight kisses. Fill out the Adoption Inquiry form on our Adoptions page if you would like to learn more about Chica.